This table is hand-crafted in the U.S.A. 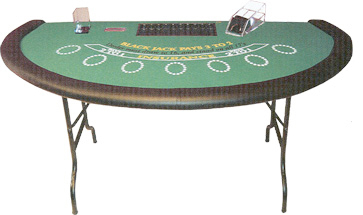 This popular Folding Blackjack Table (BJT-1130) is perfect for home or club use. Each table features collapsible black metal legs, a padded armrest (black or burgundy), a padded synthetic material playing surface (green, burgundy, or blue), and a built-in chip tray and money slot. The Blackjack Table measures 72" across x 42" deep and it is available in 30 inch (#BJT-1130-30) or 36 inch (#BJT-1130-36) heights. Our BJT-1130 Blackjack Table with Folding Legs weighs about 75 pounds. For additional information on our Blackjack Table with Folding Wood Legs, please contact us at 1-800-233-0828. You might also be interested in our Full Size Folding Blackjack Table, our Blackjack Table with Folding Metal Legs, and our full selection of Blackjack Supplies.